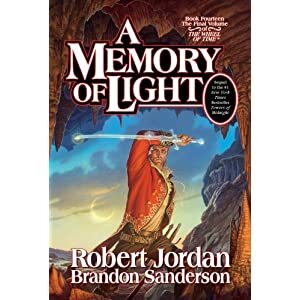 It’s been years in the making, but the Wheel of Time series by Robert Jordan (With much help from Brandon Sanderson) finally came to an end this month with the final book, A Memory Of Light. I enjoyed the book a lot, and initially read it slowly letting my mind process and enjoy it. However, once I got to the Last Battle and the final conclusions we’d all been waiting for for decades, I couldn’t put it down and read the final 300 or so pages at once, until 1:30 in the morning. Luckily there is a lot of action and plot development in this book, something that’s not as present in other books of the series. This actually has the effect of making the book feel rushed. Robert Jordan created such an expansive world that he kept taking us down new branches of story, to the point that it was difficult to see the end coming. Certainly this make people disgruntled, even though I often wish my favorite books didn’t have to end. It’s often about the journey more than the destination. So when Robert Jordan died, despite promising he would get to the point, it took Sanderson three books to wrap it up, and he probably needed more. There were a lot of interesting story lines that I felt could’ve been expanded on, but perhaps I’m just used to it taking multiple books for things to play out. I’d love to see more from Sanderson, or even another author, in this world. There are plenty of untold stories along the way like a prequel based on Tam’s journey, and there are plenty of adventures that could be expected to take place after. Even knowing what’s coming, a couple of books on the world leading up to the sealing of the Dark One in his prison and the Breaking of the world could be a good read. I know Brandon Sanderson is not Robert Jordan, but I think he did an admiral job with the three final books. It’s a tricky thing to do, but I arrived at the end of the book satisfied with it. There were sad moments and triumphant ones, expected conclusions and some interesting twists. (At least if you hadn’t endlessly nitpicked every sentence of the previous 13 books already) Ultimately, I felt it a believable ending even if it’s not exactly how I would’ve expected it to go. Without revealing anything, I felt the ending/epilogue was a little short. The book tries to touch on each and every character in some way, but there is a lot left unresolved and it feels like there was a little too much lingering on one or two secondary/minor characters than others. I understand the idea of wanting to leave the world very open ended, I just felt like there was a thread or two that needed to be tended to. Overall, it was bittersweet to see the series finally come to an end. I enjoyed it immensely, even the meandering books in the middle. Thank you Robert Jordan and Brandon Sanderson, and now bring on the next epic fantasy series! I welcome suggestions on what to read next. I’m up to date on the Dresden Files, and The Song of Ice and Fire. Who’s the next Robert Jordan?